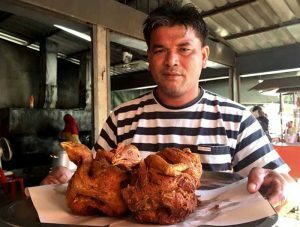 A shop selling fried chickens in Surat Thani is doing a roaring trade with a new gimmick. The Bangroon Fried Chicken shop in Soi 33 is frying the whole bird head and all. Shop owner Paisan “Bangroon” Tokantee, 41, said the idea came to him after Chinese New Year, reported Thairath. He said that the flesh was soft and the skin lovely and crispy – and customers were queuing up at his shop from six am to 7pm. 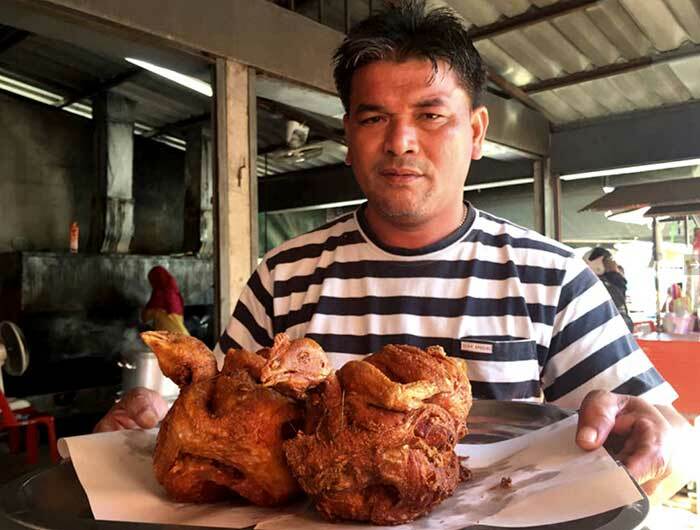 Bangroon has been selling chicken in the area for 20 years. He said that he changes the oil every day and his chickens are always bought fresh. And like Colonel Sanders he naturally has his own special recipe. “The secret is marinating them overnight”, he said, without giving away further details of his recipe for success.